Immigration • One-year anniversary event set for Friday, though many politicians will skip ceremony. 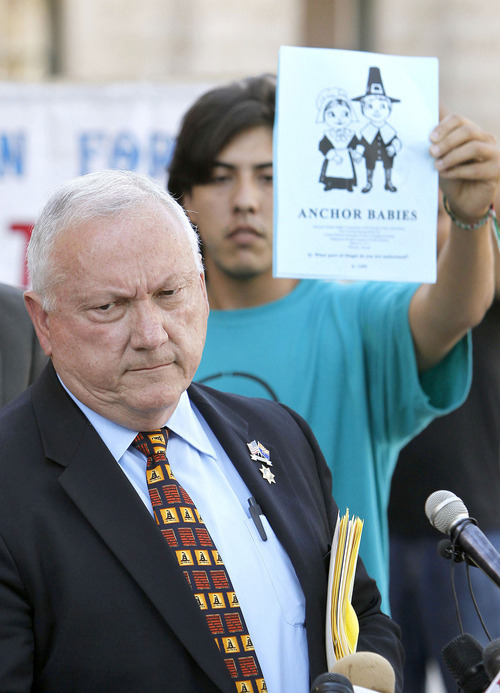 Ross D. Franklin | The Associated Press Arizona state Sen. Russell Pearce, R-Mesa, left, talks Tuesday about efforts by state legislators to propose legislation to deny U.S. citizenship to children of illegal immigrants. Protester Abraham Venzor-Hernandez, of the Puente movement, which works for fairness in immigration reform, stands in the background. Chris Detrick | Tribune file photo Gov. Gary Herbert speaks during the annual Utah County Republican Party convention at Maple Mountain High School in April. Herbert was speaking in support of guest-worker law HB116. Rick Egan | The Salt Lake Tribune Arizona Senator Russell Pearce, talks about SB 10-70 in his office at the State Capitol in Phoenix, Arizona, Monday, September 27, 2010. Pearce met with a dozen Utah Lawmakers and Lt Governer Greg Bell earlier in the day. 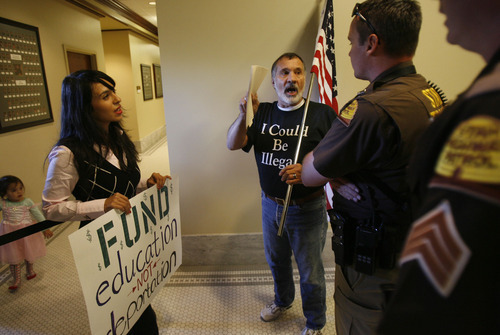 Francisco Kjolseth | The Salt Lake Tribune Things get momentarily heated as Melodía Gutiérrez and Michael Picardi are pulled aside by highway patrolmen during an argument with supporters of Rep. Stephen Sandstrom immigration bill during a press conference in support of bill at the Utah State Capitol Salt Lake City Nov. 17, 2010. 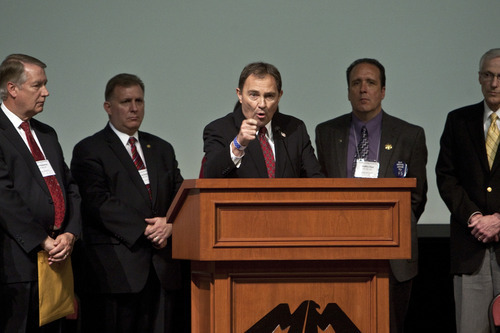 PAUL FRAUGHTON | Tribune File Photo With religious, community, business and government leaders behind him, Utah Gov. 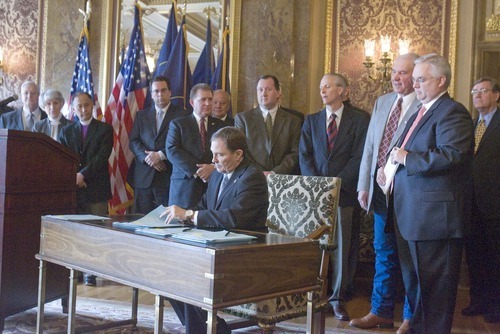 Gary Herbert on March 15 signed legislation that grew out of the Utah Compact statement of principles. The bills included a controversial guest-worker program (HB116) and an enforcement bill (HB497). 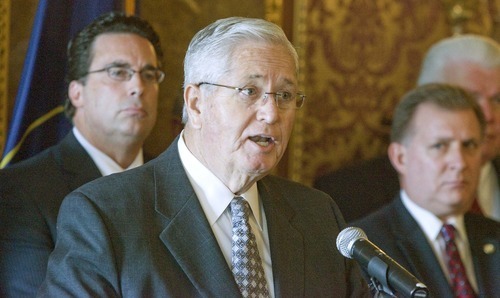 H. David Burton, presiding bishop of the LDS Church, was among the supporters invited to attend Gov. 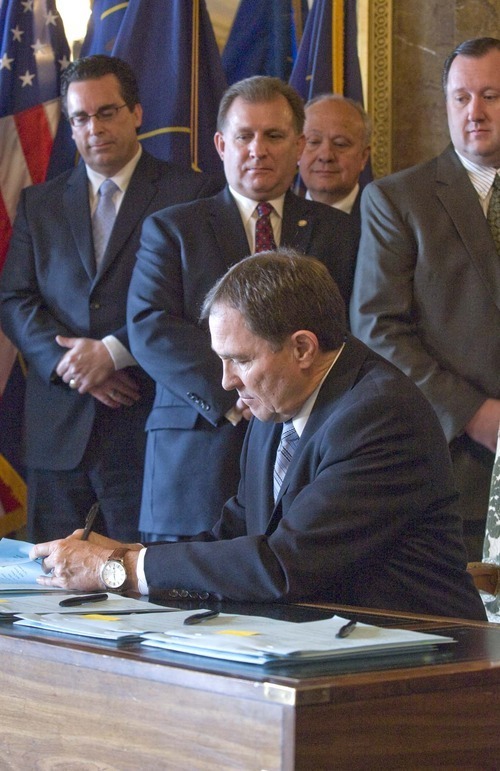 Gary Herbert's signing of Utah's package of immigration laws last month. Burton's presence and praise of the bills marked the first time the church took a public stance on specific immigration legislation. 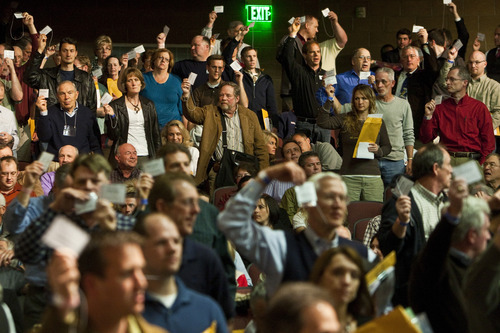 PAUL FRAUGHTON | Tribune File Photo Photo by Chris Detrick | The Salt Lake Tribune Delegates vote in favor of a resolution seeking to repeal a guest worker immigration bill during the annual Utah County Republican Party convention at Maple Mountain High School Saturday April 30, 2011. A resolution seeking to repeal a guest worker immigration bill signed by the governor earlier this year passed narrowly at the Utah County Republican Organizing Convention. Francisco Kjolseth | The Salt Lake Tribune Melodia Gutierrez uses a loud speaker as she leads hundreds of opponents to recent immigrant bills awaiting the governorn's signature while marching to the Capitol along State street in Salt Lake on Saturday, March 5, 2011. 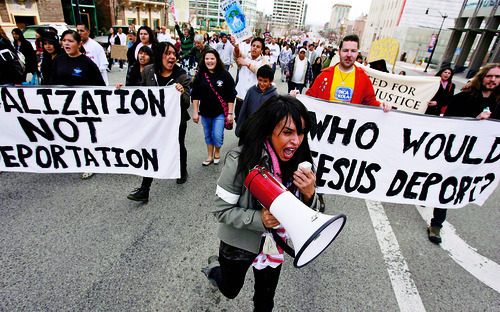 With only 5 days left in the Utah legislative session in which legislators will decide the fate of 100,000 or so undocumented individuals, United for Social Justice (USJ) along with supporters, gathered at the Salt Lake City and County Building on Saturday for a rally and march to the Utah State Capitol in support of immigrant rights. DJAMILA GROSSMAN | The Salt Lake Tribune Nelly Flores, 18, reads a statement as she gathers with other local youth outside the Capitol to read messages regarding immigration bills in the Legislature on Wednesday. The rally was was organized around the theme "Our Future is on the Line" and was organized by a group called "YEAH and Justice." PAUL FRAUGHTON | Tribune File Photo Utah Gov. Gary Herbert on March 15 signed into law immigration bills passed in this year's legislative session, including a controversial guest-worker plan. The signing ceremony included leading lawmakers, LDS Presiding Bishop H. David Burton, far left, Sutherland Institute President Paul Mero, fourth from left, and Salt Lake Chamber of Commer President Lane Beattie, sixth from left. It started with a lunch meeting at the New Yorker restaurant in the summer of 2010 amid Utah making national headlines for two rogue state employees leaking a confidential list of 1,200 alleged undocumented immigrant names. It was also the summer that Rep. Stephen Sandstrom, R-Orem, was attempting to draft a mirror of Arizona's enforcement-only immigration bill. Jason Mathis and Marty Carpenter, of the Salt Lake Chamber, set up the lunch that July with staff from the Catholic Archdiocese of Salt Lake City, the United Way and the Sutherland Institute, a conservative think tank, to try and figure out a way to change the immigration debate. The eventual result was The Utah Compact  a 213-word document that sought to frame the immigration debate around federal solutions, keeping families together, law enforcement focused on crime rather than civil violations and the economic impacts of immigration. "It was a very new sort of thing. I don't think we knew what to expect," Mathis said. "By the time we launched it in November, more than 100 people had a chance to weigh in on it." The document and its backers proved influential: a package of bills passed by lawmakers and signed last March by Gov. Gary Herbert, with LDS Presiding Bishop H. David Burton among supporters on hand, was touted as the legislative outgrowth of the Compact. On Friday, the framers of The Utah Compact will gather at This Is The Place Heritage Park to commemorate the one-year anniversary of its signing. 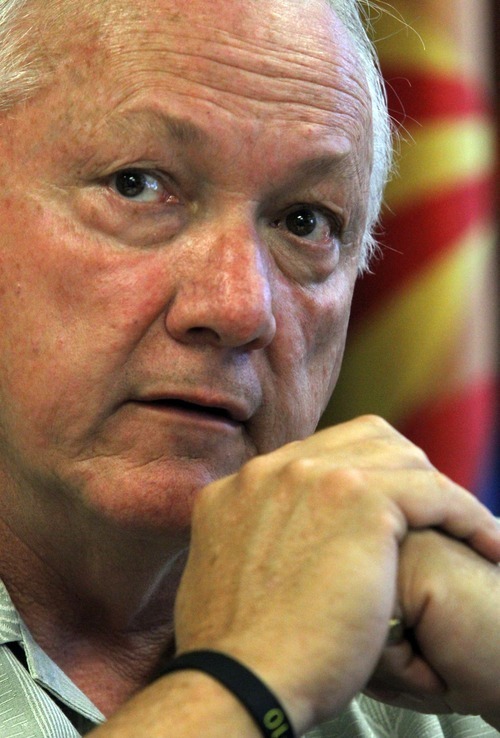 The event takes place just three days after anti-immigration stalwart and Arizona Senate President Russell Pearce lost a recall election in which the compact and the Mormon church stance on immigration became part of the debate. Several state lawmakers will be there, as will representatives from the Salt Lake Chamber of Commerce, the Sutherland Institute, the Catholic Diocese of Salt Lake City and the LDS Church, which endorsed The Utah Compact and supported HB116, Utah's guest-worker law. Absent from the ceremony will be anyone who could do anything about the Compact's very first principle that seeks federal solutions to the problem of illegal immigration. Invitations were sent to all members of Utah's congressional delegation but none will attend - with Sen. Mike Lee and Rep. Jason Chaffetz declining the invitations, according to Mathis. Both ran on platforms of tough immigration enforcement. Rep. Rob Bishop is attending Veterans Day events but is sending a representative to the Compact ceremony. Sen. Orrin Hatch's office said he would be in Washington, D.C., and couldn't make it due to scheduling commitments. Rep. Jim Matheson, D-Utah, had previously scheduled Veterans Day appearances, according to his staff. And the governor staff said they weren't aware of the event until asked about it Wednesday by The Salt Lake Tribune, although the organizers say he was invited and declined due to a busy schedule. Herbert and other Utah politicians have been hammered by Republican activists over immigration  particularly HB116. Delegates at the GOP Convention in June narrowly passed a resolution calling for repeal of the law. One of the key signers of The Utah Compact, Bishop John Wester of the Catholic Diocese of Salt Lake City, said he had planned to be there but got called away for a conference and couldn't make it. He said he'd be sending a representative in his place, however. "I think the concept of the compact is a possible game changer," Wester said. "Of course, it has no teeth in it. It has no mandate, but that's the very nature of a compact  it's a gentleman's or gentlewoman's agreement  that is a principled, moral document." And Sandstrom, who opposed the HB116 guest-worker law, said he believes The Utah Compact "was a good starting point for dialogue on the issue." It also, in the past year, served as a template for other states to steer their immigration debates. The Indiana Compact was signed three months after The Utah Compact and has picked up 3,900 signatures since it was launched. Kathryn Williams, co-chairwoman of the Alliance for Immigration Reform in Indiana, said they were looking for "a way to slow down" an immigration bill in the state Legislature that was emulating Arizona's law and someone in their working group mentioned The Utah Compact. After some research, they decided to draft their own version. "We had the Super Bowl coming into town and we were worried about the fallout in the hospitality industry  losing reservations, tourism and a black eye for the state  The image of the state, really," said Williams. "As in, do you seem friendly?" Utah Attorney General Mark Shurtleff, who will emcee the Friday event, said getting other states to draft their own compacts has been one of the key accomplishments in the immigration discussion. Including Indiana and Maine, which have their own compacts, he said his hope is for more states to draw up their own versions. "Our original goal was to have an America's Compact and that was hopefully going to influence congressional action," Shurtleff said. "But since Congress clearly isn't going to act for at least the next year or two, let's have the states tackle it." But that would seem incongruous to Ron Mortensen, co-founder of the Utah Coalition on Illegal Immigration. Because the first principle of the Compact seeks federal solutions, Mortensen said it's invalid because the U.S. Supreme Court upheld Pearce's E-Verify law that allows Arizona to require employers to participate in the program and can level stiff fines if they're not in compliance. "I think what the courts have shown is that states can offer solutions," Mortensen said. "The Supreme Court ruling showed states have a role to play in immigration." Mortensen also took issue with the signing of the compact happening on Veterans Day. "It's an insult to all the veterans," Mortensen said. Carpenter, however, said the reason Nov. 11 was chosen was because it was the day the Mayflower Compact was signed, and it was simple logistics in trying to coordinate all of the officials to appear at the Capitol the morning it was signed. Developed and promoted by Utah business, political and religious leaders, the document sets out a set of principles to guide immigration policy. The Compact calls for keeping families together, recognizing that immigration is a federal responsibility, keeping local police focused on enforcing criminal laws and acknowledging the economic contributions of immigrants.